This protected anchorage is close enough to Vancouver for a day trip, but secluded enough for an overnight cruise that will feels much more remote than it is. When you’re in need of a weekend retreat, but time is tight, there is a local gem just an hour outside of Vancouver. 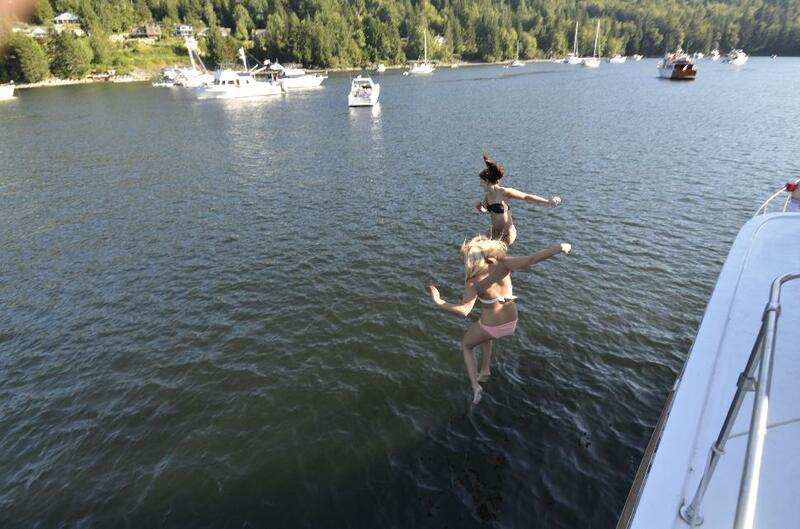 Bedwell Bay, tucked comfortably in Indian Arm, offers the pleasures of a remote anchorage without the long journey. Be it a day or overnight trip, there is plenty to see in this short cruise past the North Shore mountains, through the industrial waterways of Vancouver Harbour and into Canada’s southernmost glacial fjord. Easily one of the best anchorages in Indian Arm, this small yet lively bay is a well-known gunkhole for local boaters from Vancouver and surrounding areas. John Christie, owner of a 35-foot cruiser based in Vancouver Harbour, says that he and his wife have been going to Bedwell Bay ever since they started boating. Since it’s one of the only sheltered anchorages near the city, he says it gives you that remote feeling while still being close to home. And, because it’s not too far, you have an opportunity to make sure everything is working well on the boat before heading on a longer cruise. He also says it’s a good destination for people new to cruising because of its close proximity. With its location at the eastern end of busy Burrard Inlet just inside the mouth of Indian Arm, getting to Bedwell Bay can require some tricky navigation. Heading east from English Bay, boaters need to pass under Lions Gate Bridge at First Narrows, through Vancouver Harbour, and under the Ironworkers Memorial Bridge and the Second Narrows Railway Bridge. Remember that Vancouver Harbour is a working port with plenty of commercial and recreational traffic. Clearance is not an issue under the Lions Gate and Ironworkers Memorial bridges but the Second Narrows vertical lift railway bridge is only 10.8 metres at its lowest setting, and raises to 46 metres at its highest. The bridge is usually up, but if you require it to be raised call the bridge operator on VHF Channel 12. Currents under both the Lions Gate and Second Narrows bridges can be very strong, and if it’s windy, conditions can be quite rough. However, if you plan your transit for slack tide, it can be a lovely cruise with lots to see in the port and scenic views of the North Shore mountains along the way. Once past the Second Narrows turn left at Roche Point and north into Indian Arm. It’s here that you enter a quiet zone where all the traffic and buzz of the city virtually disappears. This coastal fjord extends 11 miles north (use charts 3495 or 3311) with a variety of attractions to check out and explore including marine parks, secluded islands, quaint towns, the Bunsen Lake PowerStation, waterfalls and the infamous Wigwam Inn. Bedwell Bay is located just passed Deep Cove and Belcarra on the east side of the inlet. As one of the only sheltered anchorages in Indian Arm, Bedwell Bay is a popular spot, but allows a few places to drop a hook. At the south end of the bay there’s a 30-to-50-foot mud bottom that holds well. John usually drops at 30 feet, and says it’s well protected, and while they’ve been pushed around by the occasional northerly wind, they’ve never dragged. Alternatively, it’s also possible to stern tie at the northwest end where the terrain is more rugged and there are a few trees and big rocks to tie the boat up to. Or if you’re heading up with a crew, rafting up together is always a fun option. There are few hazards, but the bay does shallow a bit at the southwest end near the shore. During peak season, there is a busy stretch between Belcarra and Bedwell where boaters, kayakers and a practicing water skiing team are active. There is plenty of room for all, just be aware and vigilant. Bedwell Bay has a century’s worth of history (and mystery) lying below the surface. Four well-documented shipwrecks lay deep under the waters of Bedwell Bay; a 110-foot wooden-hulled American submarine chaser, a small, officially unidentified wooden schooner; the steel-hulled, steam-driven SS Amur (aka SS Famous), and the 136-foot American YMS-159 Minesweeper. However, earlier this year the Shipwreck Exploration Team of B.C. discovered two additional vessels on the ocean’s floor, possibly dating back to the early 1900s. Each with a story to tell, it’s an attractive area for researchers, explorers and divers alike. The bay was also used as home to Canadian and U.S. warships during the First and Second World Wars. Vessels were stationed here while awaiting reassignment. After the Second World War ended, it became a marine location for surplus warships. It’s easy to make the most of your surroundings in Bedwell Bay. Kayak or dinghy to shore where a short walk to the main road leads to the popular Belcarra Regional Park. Find amenities like a picnic area, a public dock for loading and unloading, toilets, a telephone and a very popular fishing/crabbing area. To the southeast, homes and private docks of the small village of Belcarra dot the waterline and toward the northwest it’s a rugged terrain of rock cliffs and forest. Twin Islets Marine Park just north of Bedwell Bay offers a dinghy dock, campsite, picnic tables, drinking water, toilets and hiking, and is another popular area to kayak or scuba dive. During fall season the bay takes on a different energy. It’s not as busy as the summer months, so the waters are quieter and calmer. John and his wife Linda enjoy this later season cruise because of the tranquility. It’s a wonderful time for kayaking, picnics on or off the boat, and although surrounded by evergreen trees, there are some beautiful deciduous trees that change colour with the fall. At night it’s the perfect scene to relax with your favourite beverage, be it hot or cold, and watch wildlife at play. Seals and otters are abundant! 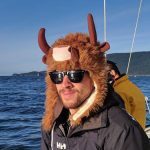 A tip from John, “There’s a marker buoy at the beginning of the bay, and just outside of that is a great place to set some traps.” Another popular spot is off the floating dock in Belcarra. Make sure you check the DFO site for updates and redtide alerts. Bedwell Bay is also a known hot spot for catching fresh crab. Crabbing season is open all year for Dungeness and Red Rock crabs, however, locals have noted that the best catches often come during late summer and early fall when it’s not as busy. If you’re looking for one more night on the boat before the season ends, and want a getaway without going to far, or just want a remote hangout for the day, check out Bedwell Bay. There are few other places that you can go to get a protected overnight anchorage so close to the city.